This week in the History of Magic, we’ll go into the story of Max Malini, one of the famous magicians of the 19th century. In the small town of Ostrov near the then Polish-Austrian border (now Czech Republic) on August 14th, 1873, Max Katz Breit was born. 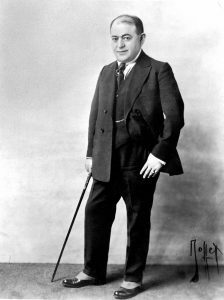 He became known as Max Malini or just Malini and was known as “The Last of the Mountebanks.” Max Malini did not look like your typical, elegant performer, as he was short in stature and a little rotund. Despite having hands that were famously too small to cover a playing card and thus seemingly unable to palm a card—a distinct disadvantage for an aspiring magician—he nevertheless excelled in sleight of hand. Regardless of his overall appearance, Malini went on to become one of the best close-up performers of the age. His skill and knowledge of timing, pre-show planning, misdirection, and subterfuge were to become the hallmarks of his career. 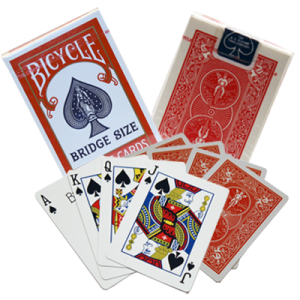 Each night before he retired, he would place all his pocket magic tricks out on his night table and immediately the next morning, the same effects would be replaced into their respective pockets again. He was most meticulous about this procedure. At an early age along with his family, Max Malini emigrated to America. At around age 12, he began to study juggling under the tutelage of Professor Seiden. When he was 15, he began to study magic seriously and it was not long before he was appearing in the rough-and-tumble saloons of the Bowery as an early busker, entertaining the patrons for small tips. His early magic consisted of mostly playing card and coin magic, and he developed the skill of utilising common everyday objects in his magic, becoming one of the all-time great impromptu performers. From these humble beginnings, he was to later travel the world and perform for heads of states, royalty, presidents, monarchs, and the aristocracy. Famous magicians like Dai Vernon, Ricky Jay, and Charlie Miller held him in high regard and they were unable to fathom many of his magic secrets. Malini was not one to fraternize with fellow magicians, so the opportunity to chat or discuss various methodologies never came up. During his early days travelling around America, Malini would often accost perfect strangers and, whenever possible, socialites or well-known citizens with a little impromptu stunt that he became quite famous for. He would engage someone in brief conversation then suddenly bend down and bite off the button on the person’s cuff. Displaying it in his teeth, he would then bend down and seemingly restore the button on again. He would then sell them tickets for one of his private shows, which were usually in his hotel room. He enjoyed intimate small groups as his audience and was adept at this form of personal publicity. His performance style was one of audacity but with his distinctive European/Jewish accent, he managed to get away with it. He became known as the “Napoleon of Magic” and a man of culture and refinement. He would set up in a hotel room using a three-sided screen, large table, and potted plants acquired from a local florist in return for two free tickets to his show. When his fame spread throughout the United States, Malini began to travel extensively overseas to Europe and Asia which were becoming lucrative areas for variety acts including magicians. He performed for the crowned heads of state, high society, and the nobility. On one occasion, he landed in Yokohama without a booking. He simply walked the streets flamboyantly, picking up pebbles that with a flourish he changed into $20 gold coins. This impromptu stunt got his picture on the front page of the local newspaper, and this soon led to a number of bookings. Over the years, Malini acquired a number of exotic gifts and treasures from overseas royalty. He only met with the famous and wealthy and was heard to say on more than one occasion, “If you want to be wealthy, then it is important that you mix and mingle with the wealthy.” Malini always gave the appearance that he was indeed a rich man of means. He was always impeccably attired with his beaver skin top hat, cape, and gentleman’s walking cane. Even his highly polished shoes had spats. One of his most spectacular magic tricks involved placing a borrowed coin under his hat, intimating that the coin would turn over while under the hat. He would then go into a few card tricks then finally return to the hat, which when lifted up would show a huge block of ice or a large builder’s brick. This particular piece of magic was just simply amazing. Dai Vernon and other magicians saw Malini perform this a number of times and though they were well-aware of the effects of misdirection, they never were able to see the block of ice being loaded. This same magic trick has caused a long debate and much discussion on the popular Magic Café Forum. It is doubtful whether anyone alive today has any idea how Max accomplished this effect. If the occasion was right, sometimes the block of ice would appear on top of his head when he removed his hat. Max Malini modified the standard and time-favoured Egg Bag by using a new method that has become a firm favourite with professional entertainers. 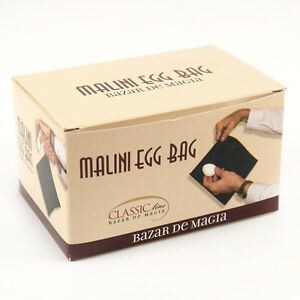 The Malini Egg Bag is still available from select magic dealers and is regarded as the ultimate egg bag. Although it is slightly smaller than the traditional egg bag, it has become a classic with adults and children alike. And then there’s Malini’s performance of the famous Cups and Balls magic trick, which he performed always impromptu. No chrome or copper plated cups here, but instead three regular china drinking cups or glass tumblers wrapped in newspaper. Taking a wine bottle cork, Malini would deftly shape small cork balls using a pen knife and then proceed to give a bewildering impromptu rendition of this ancient magic trick. Max Malini was also known to take a handful of free dry crackers found in many cafés at the time and crush them in his small hands. When he opened his hands, the crackers were gone and in their place were silver coins. Then taking a spectator’s glass of beer, Malini would place a napkin over the glass, then slap his hand down on the glass. The glass of beer would disappear. Moments later, he would reproduce it from inside a spectator’s jacket a few tables away. Malini also made a vanished banknote with a missing corner miraculously reappear with its missing corner inside a lemon or borrowed egg. Nearly always the magic seemed impromptu and unexpected, but often it was set up unsuspectingly well beforehand for full effect. That’s a really good lesson for most of us. Over the years, Max Malini visited Hawaii a number of times. In August 1934, along with famous Wild West Will Rogers, he was billed on the same programme hosted by the Hawaiian Elks Lodge 616 in Honolulu. Malini performed for the 400 Elk members at the Honolulu Civic Auditorium after being inducted into the Lodge. In later years, he performed at all the major Hawaiian hotels and clubs, as well as benefit shows for Shriners hospitals and children. He became ill and gave his last performance for American servicemen based at Pearl Harbour, during which he was seated throughout his performance. He passed away on October 3rd, 1942. His ashes were forwarded to the mainland for final internment at the Weinstein Bros. Memorial Chapel in Chicago. Though he has passed into the history of magic, Max Malini remains a mentor for all close-up conjurors to study. Malini is a legendary magician, since many of his effects are still secret to this day. I wasn’t aware he was performing about the same time as Houdini… did they ever meet? Are there any movies of Malini performing?